I’ve shared some simple cheesecake recipes here on the blog over the years. I really like using mini cheesecake pan. 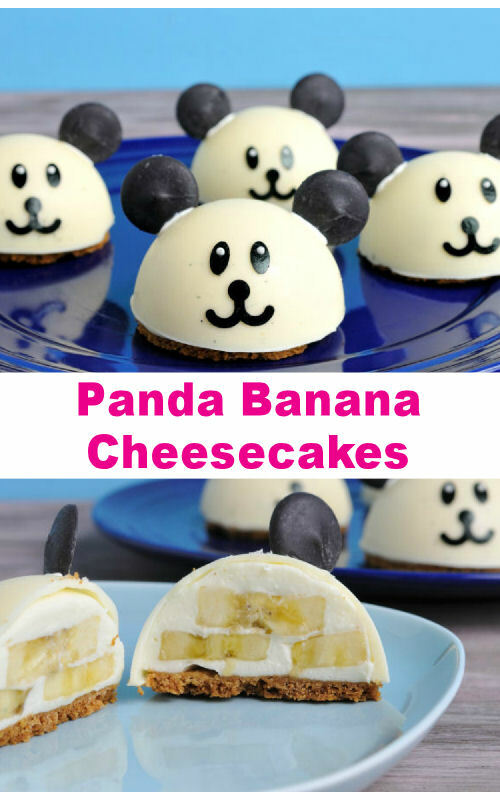 It works great and everyone loves mini desserts. They are 2 bite sized mini cheesecakes. Perfect to bring with you to a party or have in the freeze if you need a little cheesecake on a Tuesday night. Yes, I do that. Occasionally I make a larger cheesecake like Peach Cheesecake Tart and Lemon Meringue Cheesecake. Meringue wins me over every time. It’s one of my favorites. Have you tried Meringue topped Cheesecake? I also like fruit in the cheesecake. 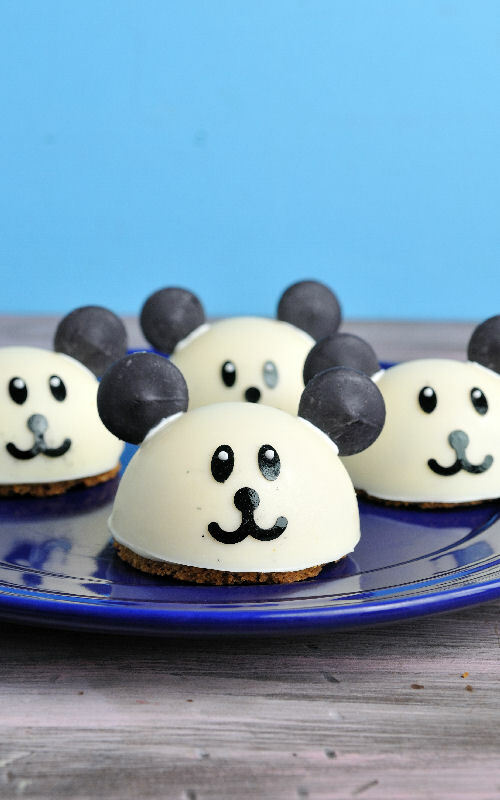 Today I’m going to use half sphere silicone mold to make adorable no-bake Panda Cheesecakes. Combine together crumbs, sugar and melted and cooled butter. Press the mixture between your fingers, it should hold together. Shape 6 cookies on a parchment paper. Using a round cookie cutter press the crust mixture inside of the cutter, carefully lift up the cutter and repeat. Baker at 350F for about 7-10 minutes, until golden brown. If crust spread while baking use the round cutter to re-cut the rounds so they fit nicely the mold size you are using. Heat marshmallows with milk until marshmallows are melted, let cool. Whip heavy cream until stiff peaks are formed. Bread room temperature cream cheese, gradually beat in melted and cooled marshmallows. Fold in whipped cream. Slice a banana. 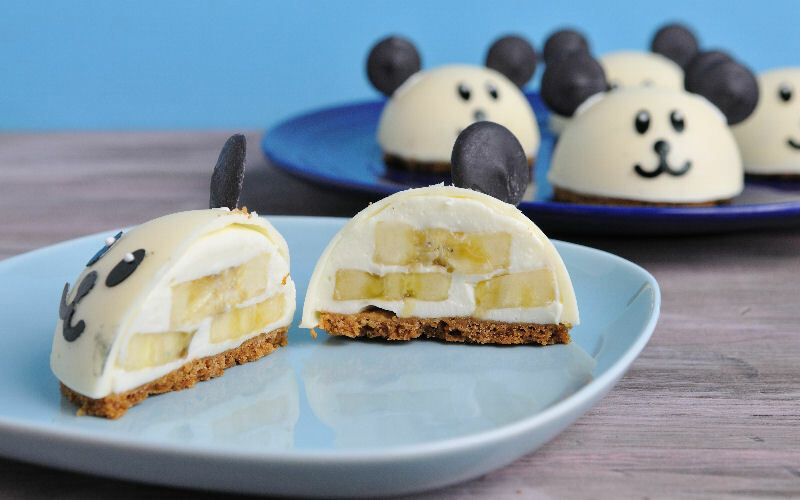 Layer filling with banana sliced into the prepared white chocolate shells. Place the cooled graham cracker cookie round on the top and press gently so it sticks to the filling. Cover and refrigerate over night or at least 4 hours. To make the shells you need to melt white candy melts, using spoon fill the silicone mold and coat the sides well. Turn the mold upside down to let the residue chocolate fall onto the wax paper. Gather fallen chocolate into a small bowl. Refrigerate silicone mold for 15 minutes and repeat the process. Let the chocolate harden 20 minutes. Carefully push the chocolate shell out of the mold. When filling the chocolate shell place the shells either back into the mold or use a cupcake pan to support them while you are filling them with the filling. 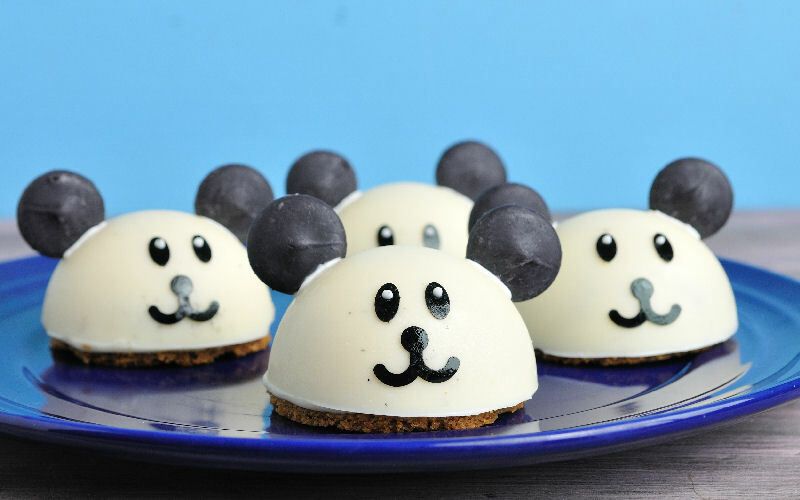 After cheesecakes are set, remove the dessert from the mold or cupcake pan and place the cheesecakes onto a plate. 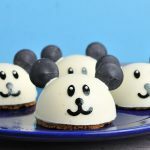 Cut 1 black candy melt in half, use white chocolate to glue the halves onto the white chocolate shell to make the ears. Use frosting sheet to make the eyes. Use a punch to cut out eyes and the mouth from the frosting sheet. Use black edible marker to color frosting sheet, is using white sheet. Remove the backing acetate layer and carefully place the eye onto the chocolate.